My boss hooked me up with a wonderful surprise. I have been a great fan, or should I say, admirer of the guy, for since I can remember watching him talk on TV. I specifically was attracted with his intellect and personality. Of course, aside from the fact that he is incredibly cute. So we went to his apartment in Malate, Manila for a scheduled painting delivery. We entered an old building with huge replicas of some famous European arts in the hallway. I thought it was damn swanky. So as we entered his unit, I was in awe. The interior of his house was somewhat eclectic yet classy and comfy. He was generous enough to offer us drinks and accommodated us with a little talk. He said, he chose my art work "Bulong" because it looked like his wife. True enough, for some strange coincidence, the painting I did that was just a product of my imagination does have a resemblance to her wife. I had Goosebumps. So he went and entertained while I was just starring at his face the whole time. I have a big crush on him ever since and I am just in pure disbelief that it is happening. 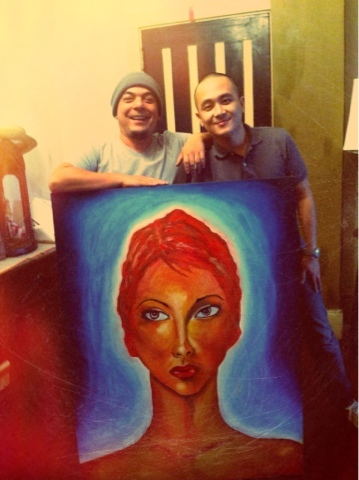 Carlos P. Celdran now owns one of the pieces in my Presensiya Exhibit. A piece that took me the longest time to make. I am happy and proud that a "Carlos Celdran" owns a Katagiri. congrats...amazing artwork by the way.